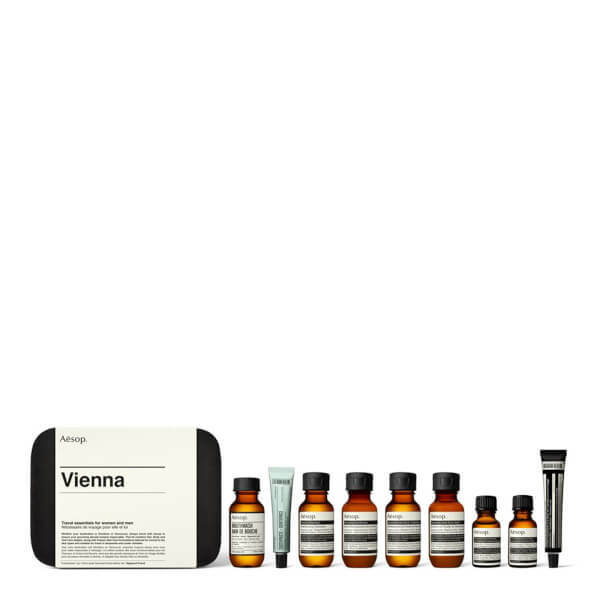 The Aesop Vienna travel kit combines hair, body and oral care essentials to maintain freshness during your travels. 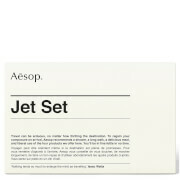 For both men and women, the must-have collection is housed in a handy travel box. A low-foaming, mild formula that works to eliminate daily build-up of dirt and impurities, without over-drying or uncomfortable tightness. Catering specifically for sensitive or normal skin, the olive-derived, clear gel contains Bergamot Rind, Chamomile Bud and Rosemary Leaf to gently cleanse skin whilst delivering a comforting, herbaceous fragrance. 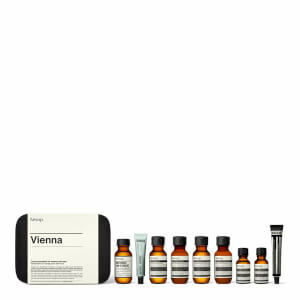 Your complexion is left feeling calm, rebalanced and refreshed. A delicate, alcohol-free toner formulated with Panthenol (Pro-Vitamin B5) and antioxidant Green Tea extract to clarify, refine and unblock pores. Catering for most skin types, including sensitive, the lotion tones skin without stripping moisture so you can achieve soothed, rebalanced skin that is prepared for moisturising and subtly fragranced with a floral, herbaceous aroma. Suitable for daily use. 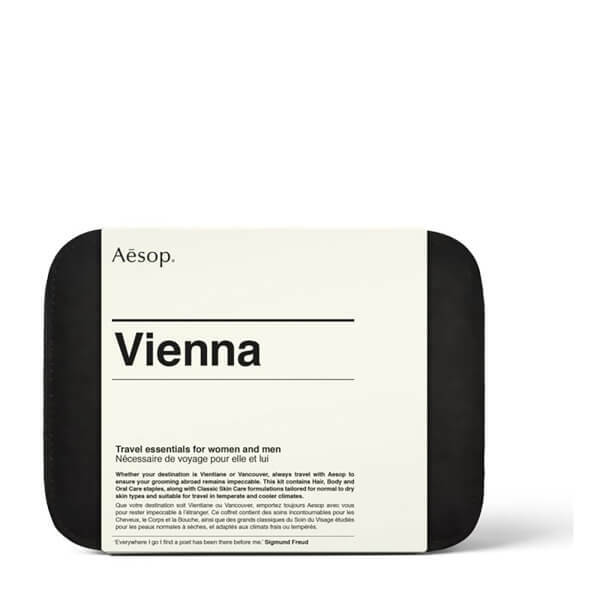 A rich, deeply moisturising face cream fortified with extracts of nuts and plants for antioxidant protection. Delivering a veil of moisture without feeling heavy, the nourishing cream effectively hydrates normal, dry and sensitive skin types to leave the complexion feeling soft and mattified. 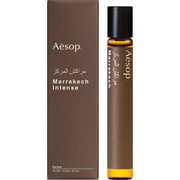 Enriched with Chamomile Bud, Sandalwood and Rosemary Leaf. Floral, nutty aroma. 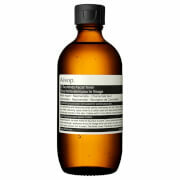 Face Cleanser: Morning and evening, pour half a teaspoon into clean hands and lather. Massage over face and neck, then rinse thoroughly with warm water. 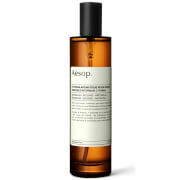 Cream: Morning and evening, massage half a teaspoon into freshly cleansed and toned skin. Face Cleanser: Water (Aqua), Olive Oil PEG 7 Esters, Ammonium Laureth Sulfate, Glycerin, PEG-150 Distearate, Aloe Barbadensis Leaf Juice, Sea Salt (Maris sal), Citrus Aurantium Bergamia (Bergamot) Fruit Oil, Coco-Betaine, Rosmarinus Officinalis (Rosemary) Leaf Oil, Camellia Sinensis Leaf Extract, Magnesium Nitrate, Anthemis Nobilis Flower Oil, Methylchloroisothiazolinone, Magnesium Chloride, Methylisothiazolinone, d-Limonene, Linalool. Cream: Water (Aqua), Glycerin, Cetearyl Alcohol, Camellia Japonica Seed Oil, Cocos Nucifera (Coconut) Oil, Macadamia Ternifolia Seed Oil, Rosa Canina Fruit Oil, PEG-20 Stearate, Palmitic Acid, Glyceryl Stearate, Steareth-21, Theobroma Cacao (Cocoa) Seed Butter, Phenoxyethanol, Stearic Acid, Coco-Caprylate, Glycine Soja (Soybean) Oil, Fusanus Spicatus Wood Oil, Triticum Vulgare (Wheat) Germ Oil, Ricinus Communis (Castor) Seed Oil, Tocopherol, Lavandula Angustifolia (Lavender) Oil, Rosmarinus Officinalis (Rosemary) Leaf Oil, Hydrogenated Castor Oil, Ormenis Multicaulis Oil, Benzoic Acid, Farnesol, Linalool, Dehydroacetic Acid, Disodium EDTA, Ethylhexylglycerin, Sodium Citrate, Limonene, Aloe Barbadensis Leaf Juice, Beta-Carotene, Daucus Carota Sativa (Carrot) Root Extract.